Axiom Zen’s CryptoKitties, which is essentially a digital version of Beanie Babies based on the Ethereum blockchain, sucked in a massive amount of funding just a few months ago. 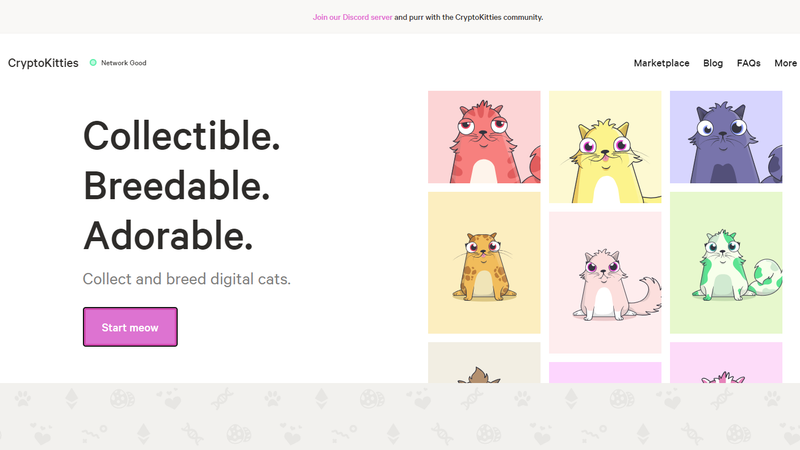 But it looks an awful lot like people bought into CryptoKitties looking for a quick return on their investment and are finding that digital cats don’t always go up in or even hold their price. Per a Saturday report in Business Insider, investors put an additional $12 million into CryptoKitties in March after users had already pumped millions of dollars into the network buying and trading the cats. Unlike cryptocurriences where each token generally does not differ in value and is indistinguishable from each other (unless perhaps they are traceable), CryptoKitties are what’s called a non-fungible token (NFT): Each one is unique. Just like a rare Beanie Baby, each CryptoKitty in theory holds a different value and has to be traded for with something like other cryptocurrencies. According to data from blockchain analytics sites Bloxy and Diar, the number of CryptoKitties transactions has fallen drastically in the last 3 months. The number of CryptoKitties transactions decreased in June by 98.4% compared to its peak of 80,500 transactions back in December 2017, according to data from Bloxy. The game is still among the most popular options for ethereum-related gaming, but public interest in buying and selling them seems to have waned significantly in recent months. ... In April, Greylock Partners took a closer look at the usage of some of the most popular decentralized apps. Drawing on data from DappRadar, the firm estimated CryptoKitties daily active users at around 907. On Friday, that same metric on DappRadar had fallen to around 300 daily active users. The Diar analytics show that the “median price of sold kitties peaked at $41 and now is constantly at about $5,” with daily trading volume down to around $21k from $2.3 million in December 2017. One of the bottlenecks is that the games only allow the most basic functionality such as breeding and battling, which leads to speculation and not much else. When the users eventually find out that there is more demand to sell than to buy, the popularity starts to fade away as easy profits are no longer made. For what it’s worth, the company says that lower trading volume does not necessarily mean that the cats themselves are becoming worthless. In an email, cofounder Bryce Bladon told Business Insider that one of the factors prohibiting people from investing further was the ballooning cost of transactions, since it’s based on the Etherum blockchain and subject to the network’s restrictions. Bladon added that they are trying to build new functionality into CryptoKitties, adding “KittyBattles” and “KittyHats”—the first being sort of a cuter version of Pokémon, and the latter being electronic accessories for the kitties themselves. Yet as noted by CCN, Pokémon Go launched to a peak of 45 million users before quickly dropping down to around five million, where seems to have plateaued. While the KittyHats might be cool, it is perhaps a strategy that works better for sustaining the interest of an already broad userbase (a la Team Fortress 2) rather than building one. Beanie Babies themselves surged in the 1990s; according to the New York Post, the brand’s strategy of discontinuing older lines of products to generate a speculative frenzy generated countless millions in profits before the mania faded and prices crashed by around the year 2000. But at the end of the day, anyone holding a Beanie Baby still had their little plushie; people spending six-figure sums on CryptoKitties could end up having the equivalent of a digital trading card to which they only own some of the rights. With the current problems of blockchain scalability, action heavy game that involves NFTs would prove to be expensive for the users and also inconvenient because of the relatively long confirmation times for transactions. It’s unlikely that a permissionless blockchain such as Ethereum would be able to handle the traffic of widespread adoption if it couldn’t even handle less than two thousand active users at its peak. But hey, at least they’re cute.